After the death of the original Carrion, grad student Malcolm McBride was infected with the Carrion virus, receiving the power to decay organic matter. "The original Carrion," since no one is likely to remember him, was a semi-defective clone of Professor Miles Warren. And since the second started out wearing the same costume as the first, this could really be either. His skin is a pale yellow, with a surprising amount of musculature for someone who's supposed to look like a cadaver. His costume is little more than a bunch of tattered rags, and a surprising amount of it is new: the hood and loincloth both appear to be fresh new molds! The boots are just painted on, but the arm coverings are especially clever: we get wrist wraps that we've seen before, but they're paired with the torn edges from Jack Skellington for a nattier look. He wears a brown satchel over one shoulder, to carry the "Red Dust" that can burn anyone it touches, and the set also includes a flight stand to allow him to hover - possibly because he can levitate, or possibly because living matter (like the ground) repels him. This character is kind of a stupid mess, even by the standards of D-level Spider-Man villains. Cloned from Spider-Man by the Jackal, Ben Reilly protected New York as the Scarlet Spider before briefly assuming the role of Spider-Man. Hey, speaking of stupid messes, The Clone Saga! 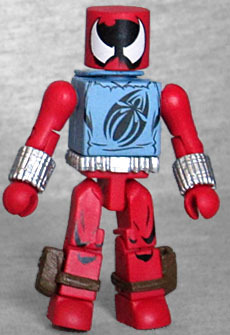 There's been a Scarlet Spider Minimate before, in the first set to ever have bios on the back. But Minimates have advanced quite a bit in the nine years since then, even if Ben is still only available as an exclusive. For instance, on the previous figure, all the costume details were painted on - these days, that's apparently not good enough! For his webshooters, Spidey has Black Widow bracelets; the brown pouches on his ankles are small knife sheaths; he's got a silver utility belt; and because it's a piece they have now, the hood on his sweatshirt actually hangs down against his back. Last time, Scarlet Spider came with one of the standard Spidey web lines, and that's still true here. But upping the ante, this one also comes with an unmasked Ben Reilly head! 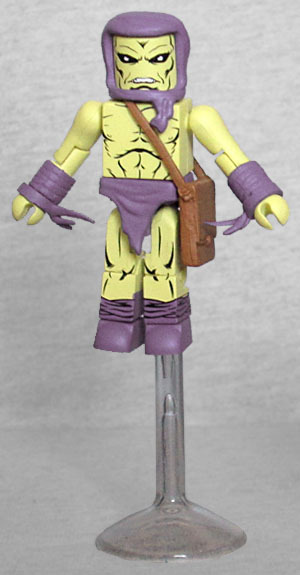 The normal head has a dark shadow on the face and gigantic, angular eyes that definitely mark it as being based on the art of Sal Buscema (which makes sense, since he was the artist on the story that brought back Carrion), while the alternate head has a generic smiling face and dyed blonde hair. Marvel Legends addendum: dat (Spider) body! This entry was posted in Art Asylum, Marvel, MMMR, TRU and tagged Minimates, Spider-Man. Bookmark the permalink.